Blood pressure (BP) values change significantly over time in response to environmental, behavioral, and emotional stimuli. These variations represent a complex phenomenon, and their assessment is possible by means of different BP measurement methodologies over different time windows: from beat to beat [very short-term BP variability (BPV)], within 24 h (from minute to minute, hour to hour and from day to night; short-term BPV), over different days (midterm day-by-day BPV), or between clinic visits performed over weeks, months, seasons, and years (long-term BPV) . While in physiological conditions these variations represent an adaptive response to environmental stimulations from daily life, they may also reflect, however, alterations in cardiovascular regulatory mechanisms or underlying pathological conditions. The clinical significance of BPV has been supported by a large body of evidence showing that the BP-related cardiovascular risk may depend not only on average BP levels but also on the degree of BPV. Either in the short term (24 h), in the midterm (day-by-day), or in the long term (visit-to-visit), increasing values of BPV have been shown to be associated with development, progression, and severity of cardiac, vascular, and renal organ damage and with an increased risk of cardiovascular events and cardiovascular and all-cause mortality (Fig. 28.1). The evidence is limited, however, regarding the question on whether increasing values of BP variability (considered as an early marker of autonomic dysregulation) may represent also a marker of future hypertension during the prehypertensive (or high normal BP) state. Aim of this chapter is to review the current evidence in the field of BPV regarding its mechanisms, the methodological aspects that should be considered for its assessment, its relevance and significance for cardiovascular prognosis as well as its potential for application in clinical practice. 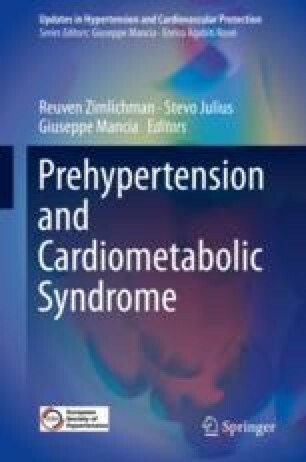 In its last part a brief mention is made on the possible role of BPV as a predictor of future hypertension, as well as on the possibility that the assessment of BPV might contribute to improve the management of subjects with high normal office BP elevation, also defined as prehypertension. Whelton PK, Carey RM, Aronow WS, Casey DE Jr, Collins KJ, Dennison Himmelfarb C, et al. 2017 ACC/AHA/AAPA/ABC/ACPM/AGS/APhA/ASH/ASPC/NMA/PCNA Guideline for the Prevention, Detection, Evaluation, and Management of High Blood Pressure in Adults: a report of the American College of Cardiology/American Heart Association Task Force on Clinical Practice Guidelines. Hypertension. 2017. https://doi.org/10.1161/HYP.0000000000000065.